Here's a neat trick that's easy to apply to your custom payment forms: Simply label your credit card number field "Card Number", and your Safari on iOS users will be presented with a button on top of the keyboard labeled "Scan Credit Card". When pressed, the camera activates and any valid card placed in front will automatically transfer the numbers to the form field. It's a super handy function but does come with one important usage rule: the site must be using a valid SSL certificate over HTTPS. From my testing the label property seems to be the most important part, with several random strings being used as the name and id property passing just fine. I have seen mention, should this not work, the field may need to have a name/id of: credit-card-number. Of course it goes without saying the built-in RackForms payment forms already use this shortcut! Super excited for the next major release of RackForms, here's a quick video tour of what's new! Came across an interesting challenge today when implementing image printing from the Entry Viewer. RackForms has an incredibly powerful and feature rich survey creation tool-set. We take a brief tour of these features in this video. Of course if you have any questions or comments about these features, please let us know! Here's a handy video made to show the set up of common email verification systems on cPanel. One item of note, should you attempt this process, is this assumes a workaround for a bad DKIM key value provided by the cPanel interface. This may have already been fixed, so the root server access may not be needed. In any event, as anyone who runs a small email server knows, it's become increasingly challenging to send messages to major providers like Gmail and Office 365, so these items are incredibly important to do, and do right! RackForms has long had the ability to import PDF files and generate web forms. The only wrinkle in this process for most users was speed. The bigger the PDF file, the slower the import process. For large forms, say, the US tax form 1040, the import process could take over 2 minutes on very fast hardware. I'm incredibly pleased to amount that starting in Build 893, due out on June 29th, that same 1040 form now takes just under 4 seconds! Key to this speed up was a much more intelligent handling of how transformed items were added to our form page. Previously, for each element, be it a form or text item, RackForms would rebuild the entire form page. Our new code path completely eliminates this costly step, instead only building the form once after all elements have been added. 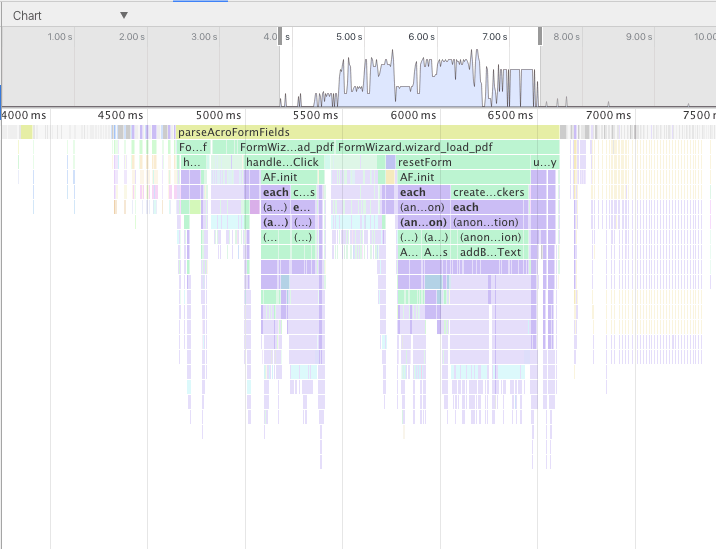 This can be demonstrated quite effectively with the following profile charts from Chrome. The first is the original process. Note the incredibly deep call stacks piling up on each other as each form element added required that full form rebuild. Also note the total time. 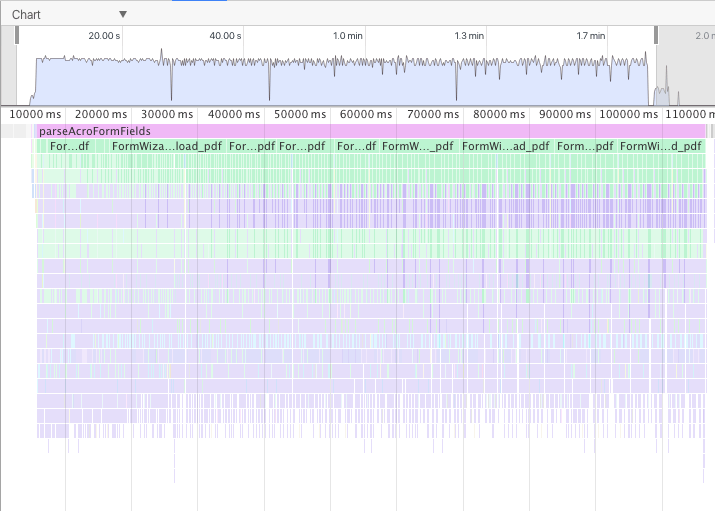 Note the much shorter time, but also the depth of the stack. The previous code spent almost all of its time rebuilding and redrawing the screen, the new one, almost none. 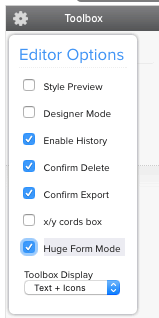 This option, when enabled, skips the form rebuild step when adding standard elements, and is a huge boost to performance when dealing with large forms. This option will actually become the standard in a future version of RackForms. With this change the PDF import process in RackForms has become much more powerful, and I can't wait to get this in every users hands! RackForms Build 885 was just released, and hot on its heals is 887, due out this Friday. This is such a great series of updates I've made a quick video showing some of the new items off! Following up on our February 3rd post, it's continuing to be a very busy first half of the year! The core goal so far has been to strengthen and enhance RackForms with fixes and features that make you more productive. Chief among these updates has been patches and fixes. As of today's release, we've fixed over 40 notable items. Some of these have been small, such as selectors not being applied to radio items for third-party UI libraries. Such changes will not be noticed by the majority of users, but for those who use libraries like Semantic UI and Bootstrap, will be a welcome change. Others are larger, and affect almost all users. For example, we've greatly enhanced the capabilities of our new alignment options when working with items in all layout modes. Such changes and fixes make you work smarter and faster. We've also had some notable features added. Two of my favorites have been the config file selector, and Save and Return Later now supporting file uploads. Features like these get at one of the core competencies of RackForms, which is to make the complex simple. Being able to use Save and Return Later with file uploads is an incredibly handy feature, and opens up workflows which were simply not possible before. Finally, a great deal of work has gone into the PDF import process. The goal here is to add extra flexibility to this process, making possible the direct import of text into our web forms. Currently, we convert text into background images. This is great for 1 to 1 matching of a PDF to web form, but not so great when it comes to file size and mobile compatibility. Instead, converting PDF text into web text will make layout much easier, and reduce file size by a great deal. Finally, a quick thanks to our new users, your support and feedback is invaluable! -Feature: Added Tooltip Support For Radio And Checkbox Items. -Fix: Submit Button Properly Disabled On Form Submission. -Feature: Log And Email Database Errors From app/movefiles/config.php. -Fix: cURL Debug Output Now Shows On All Queries. -Fix: Video Player Shows Black Screen If Not Poster Frame Set. -Fix: Database Image's Now Display In PDF Files. -Fix: Better Support For Tooltips When No Label Is Present. -Fix: Tail Text And Tooltips For No Label Items Positions Properly. As always, please stay tuned for more updates, it's going to be a great year!